Norland Repton Log Cabin: The Norland Repton log cabin is a large, two roomed log cabin using 44mm wall logs and with all glazing being Double Glazed. This combination makes these Log Cabins ideal as an extension to the living area which can comfortable be used all year round if heated correctly in winter. The chalet cut corner jointing that is used in our Norland Range of log cabins means that the corner joints are cut to very fine tolerances and are therefore very weather resistant. The Norland Repton can be built either as show in the main image or in mirror to that so that the door / integral canopy etc. all simply swap sides with each other meaning that the door would then be at the right hand side when viewed from the front. 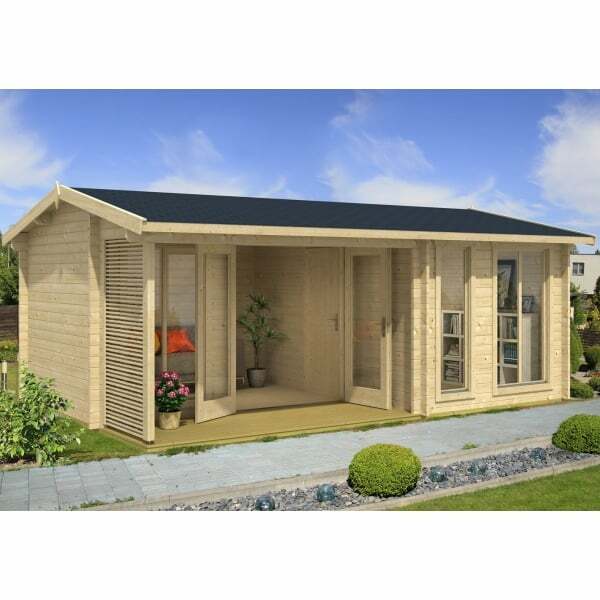 The Norland Cabin range are simply superb value, easy assembly and very durable log cabins. Full assembly instructions are included with this log cabin and there are no nails or screws required in the construction of the walls due to the traditional interlocking wall logs.